ItemI-52318 - "Mr. Wilkins and Mr. Allan at the government office". ItemI-52319 - "Lot 78 in the foreground looking southward over the development area below the main canal (east) planted 1925". 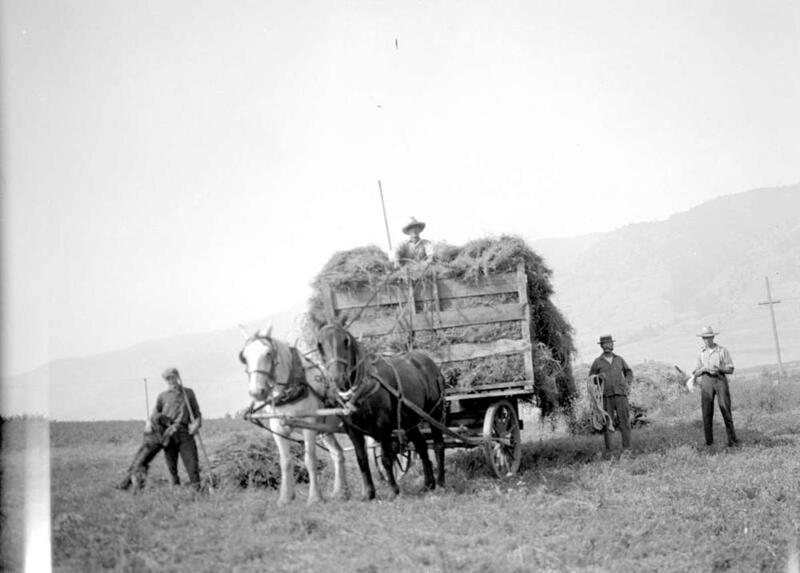 ItemI-52320 - "Apricot trees in their first year of planting, on lot 197, development area"
ItemI-52321 - "Alfalfa hay at Mr. Stowell's place, Mr. Lawrence and son, Elliott, on the load". ItemI-52322 - "An abnormally large 3 year peach tree, Captain Wilson's farm"
ItemI-52311 - "Captain Porteous showing size of cants on July 7th"; cantaloupe field. ItemI-52354 - "Southeast Kelowna, spraying (in the pink), F.E. Hodgkins orchard, K.L.O.". ItemI-52355 - "Southeast Kelowna, F.L. Hodgkins orchard, cherry trees in bloom"
Item I-52321 - "Alfalfa hay at Mr. Stowell's place, Mr. Lawrence and son, Elliott, on the load".